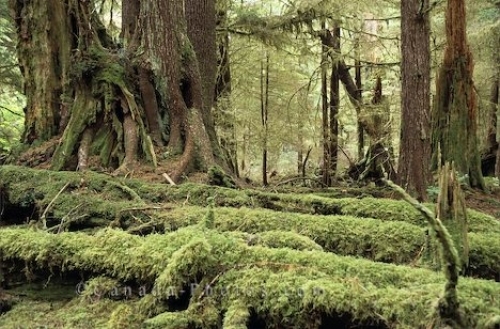 The rainforest on Graham Island in the Queen Charlottes in British Columbia, Canada displays an assortment of plants that have been growing for years. Fallen trees and trees that have been standing for hundreds of years are covered by moss, ferns and other greenery that flourish in the damp landscape of Graham Island. Picture of plants that flourish throughout the rainforest on Graham Island in British Columbia, Canada.